When 9to5, National Association of Working Women was founded in Boston in 1973, the terms “sexual harassment,” “pay equity” and “family leave” didn’t exist or weren’t widely used in the American vocabulary. But experiences with sexual degradation on the job, under-valuation of women’s work and lack of consideration for family responsibilities were common. So were the consequences, financially and emotionally, for women workers. Public library workers, as city employees of Pittsfield, Maine, benefited from the approved 2006 budget, which was adopted on December 20, 2005. Pittsfield city councilors voted for a $2.48 million operating budget, without increasing the mill rate. The original raise was proposed to be 2%, but, because health insurance costs were lower than expected, was increased to 4%. The American Library Association-Allied Professional Association Renaming Contest Deadline Extended! The American Library Association-Allied Professional Association is extending its renaming contest deadline to January 31, 2006, to provide additional time to suggest a new name that encompasses the organization’s dual missions. 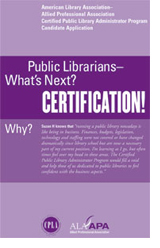 Public librarians—what’s next? Certification! The online application for the Certified Public Library Administrator Program (CPLA) will be active on Tuesday, January 17. Those who want to be the first to participate in this program may apply at www.ala-apa.org/certification/. The application fee for the CPLA program is $250 for American Library Association members and $300 for non-American Library Association members. Applications will be reviewed by the Certification Review Committee on a quarterly basis, beginning in the spring of 2006. Is your New Year’s resolution to “never be late again?” Do you wish your employees would make such a vow? This article is reprinted with permission from American Libraries, where it appeared in the December 2005 issue. The 2005 salary survey represents a break in the methodology used for the 1982-2004 surveys. For a number of years ALA members and researchers have asked for state-level salary data instead of—or in addition to—regional data. The 2005 survey was designed to meet that need. Originally printed in the NMLA Bulletin 35, no. 7 (Nov./Dec. 2005): 4 . Reprinted with permission from the author. Where else can you see librarians wearing a parrot mask, flexing muscles like Rosie the Riveter or smiling sneakily behind heavy books? 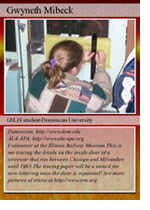 Librarian trading cards are fun, creative and important. The colorful mini-profiles demonstrate how technology can promote your profession and your library.